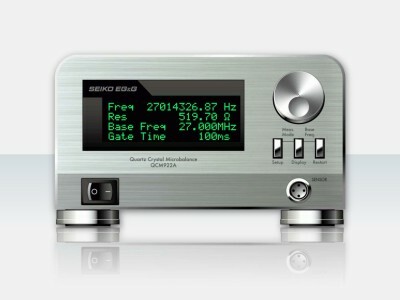 QCM922A can be simultaneously measured resonance frequency (mass change 5 to 30MHz resolution 0.01Hz), resonance resistance (= viscoelastic change) and EQCM (= Potential / Current). QCM922A expands its range of application from gas analysis and polymer absorption in solution to plating and large load samples. Because QCM922A uses separately-excited oscillation method (DDS) and has the wide range of resonance frequency and resistance. Many electrodes of resonators and cells are supplied for both systems. Copyright © SEIKO EG&G CO.,LTD., 2019. All Rights Reserved.